In his prime, Frank lived his life as a conman, a cat burglar, a man who had a high-flying life and paid the price with two stints in jail. During that time, he fell in love and had two children. Now, Frank (played by Frank Langella) is a crotchety old man, set in his ways, who suffers from dementia and lives alone in a modest home. His son Hunter (James Marsden) makes the five-hour drive back and forth each week to visit him, while daughter Madison (Liv Tyler) completes a humanitarian mission halfway across the world. When his son visits, Frank often forgets tasks and cannot remember details from his past, and the burden becomes too great for Hunter to handle alone. In this realistic near-future story, Hunter does not have to place his father in a home. Instead, he buys him a robot, and the unexpected buddy film of 2012 is born. In his old age, Frank passes time by visiting the local library and stealing knickknacks from a local store, much to the supreme annoyance of the shop owner. At the library, Frank flirts with the attractive librarian (Susan Sarandon), and they bond over their mutual love of hard copy books and their hesitation over the library’s projected renovations. Frank gets off on the wrong foot with twenty-something yuppie Jake (Jeremy Strong, The Happening, The Good Wife) who recently bought the library and is in the process of moving the books to storage and replacing them with digital copies. Frank’s relationship with his children, however, is quite good, considering that his time in jail made him somewhat of an absentee father. He converses with Madison, a very caring and loving woman, via satellite. She supports his desire to live without robotic assistance, but this does not deter Hunter’s decision to purchase one. Frank reacts to the gift as expected. He is not about to let some other being dictate what he eats, when he goes to sleep, and how he spends his days. Hunter leaves the robot at Frank’s home, and, right away, the robot (voiced by Peter Sarsgaard, Jarhead, Green Lantern) cleans the house and chastises Frank on his dinner choices. The robot’s programming keeps track of Frank’s dietary needs, helps him fulfill exercise requirements, and encourages him to take on certain tasks and activities that may help his dementia, but Frank does not want any part of it. The robot follows him into town on one of his routine walks, and, during this trip, Frank has an interesting revelation. He learns that the robot is not programmed to turn him in for an infraction, such as stealing. Because of this, Frank realizes he has not been saddled with a robotic caretaker after all. On the contrary, he has been given a new accomplice. With renewed and formerly unseen energy, Frank plots new robberies. His robot is a wiz with combination locks, as it can try every possible combination in a matter of minutes. Frank also teaches the robot how to pick locks and how to case an establishment before a job. The robot voices concerns with Frank’s chosen “activities,” but Frank reminds the robot that these activities are helping him focus. Frank plans their biggest job yet, just as Madison flies home to replace the machine. Frank fights to keep the robot as he attributes his renewed sense of life to his relationship with it. 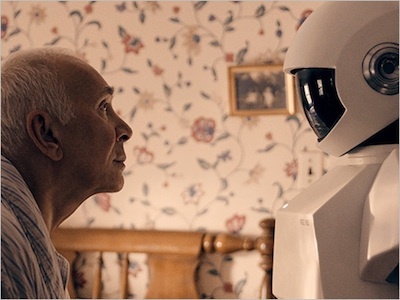 Robot and Frank accomplishes a near-perfect combination of family drama and buddy-film humor, while also exploring esoteric questions on friendship, memory, and identity. More than once, the robot speaks to Frank with a programmed agenda in mind, much how Frank speaks to the robot and everyone else around him. But, the robot has been programmed to behave as such and emotion beyond that is dubious. If Frank loses the robot, is he losing a friend? Or, is he losing a piece of himself that he was only able to rediscover through this machine? Viewers used to multi-million dollar sci-fi films should still enjoy this smaller scale indie film. It is a simple story comparatively speaking, but director Jake Schreier and screenwriter Christopher D. Ford have done an admirable job telling this character-driven sci-fi adventure. Sony Pictures Worldwide Acquisitions and Samuel Goldwyn Films have acquired the film. Look for it in 2012!